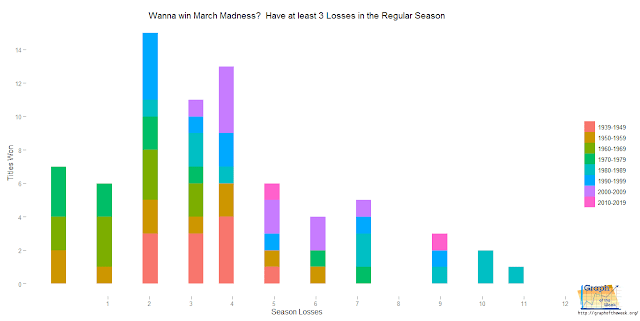 Graph of the Week: March Madness! Wanna Win? Winning percentage of all NCAA Men's Basketball Tournament Champions. Down by one, the ball spins in his hand as he dribbles up the floor. With tennis shoes squeaking, he feints left, then right. Glancing up at the clock, he sees only five seconds left. Out of the corner of his eye, he spies a teammate break towards the basket. With a knowing glance he lobs the ball upward. The crowd, already standing, goes silent and everybody's eyes follow "the dime." His teammate crouches like a panther and lurches upward. The ball floats into his hands while he twists his upper body, slamming it through the metal hoop with authority. Hanging onto the rim, his own roar is drowned out by the crowd. The buzzer blares and the game is over. They win! There is nothing quite like the NCAA Basketball Tournament. 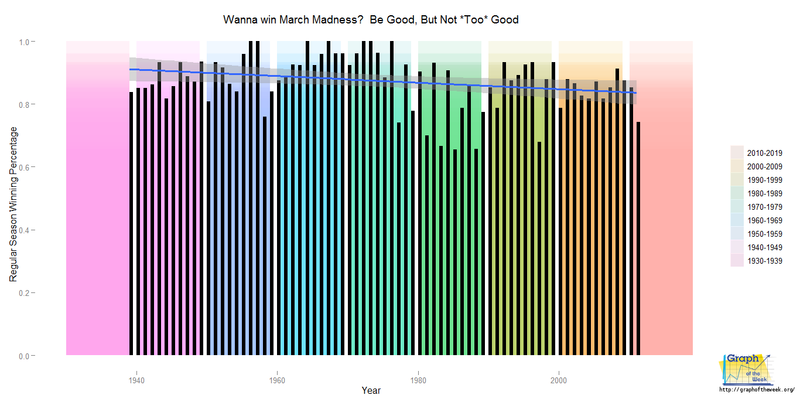 The fans love it so much that they become somewhat mad, hence the name "March Madness." Their brackets marred with eraser shavings, enthusiasts the world over fret over who they think will win. In every office pool, there is 'the guy' who has 'a theory' that will guarantee him a winner. Take a close look at the above graph. The colors which denote the decades 2000-2010 and 2010-2019 can only be seen in the bars showing three or more losses. Assuming this trend continues, then neither Syracuse (31-2) nor Kentucky (32-2) will win the 2012 tournament, as they are 'too' good. Missouri, sitting at 30-4 seems to be a strong bet, if you go along with the data presented here. The tournament started in 1939 with only eight teams, expanding between 22 and 25 teams up through 1978. It was during this time that we saw a few undefeated teams win the title. After that, the tournament expanded greatly, taking 40 teams in 1978, 48 from 1980-1982 and finally settling on 64 since 1985 (although later editions featured 'play-in' games). Since the expansion to 64 teams, it seems that the larger number of entrants (and thus games) has given the 'good, but not *too* good' teams a real shot to win it all with some regularity. It would be an interesting exercise to review this particular aspect (perhaps it has already been done). At any rate, March Madness is upon us. To all of those participating in some way: good luck! 1) Will Kentucky or Syracuse break the trend (both have only 2 losses)? 2) Will the NCAA expand the tournament further? 3) Based on this story's angle, the author thinks Missouri will win - will they? http://swampland.com/articles/view/title:expanding_the_ncaa_tournament_would_further_erode_an_already_suffering_sport The following statement is from the above website. It speaks on the effect that expanding would have. More fees, more venues, adding more weekends and such. My opinion is that you would lose a vast majority of viewers by increasing the team ratio. Speaking for me, I only watch my favorite teams, if/when they are knocked, done watching til next years. "The NCAA clearly expects that the added week of games would significantly increase the tournament’s rights fee. A larger field would mean more content, more scheduling opportunities and theoretically more revenue for the broadcaster and the NCAA, which derives more than 90 percent of its total annual revenue from the tournament’s media deal. Nearly all of that revenue passes through the NCAA and is distributed to its member institutions." That article you cited is excellent and I must agree with it. As an aside, it would be nice to see pro sports begin to reduce the number of teams in the post-season to make the regular season more meaningful (especially the NBA). Sorry for the delayed response, I was having technical difficulties! U.S. Soldiers Died from What?